In Seoul, some of the best meals you’ll eat are at restaurants located down walking side streets. 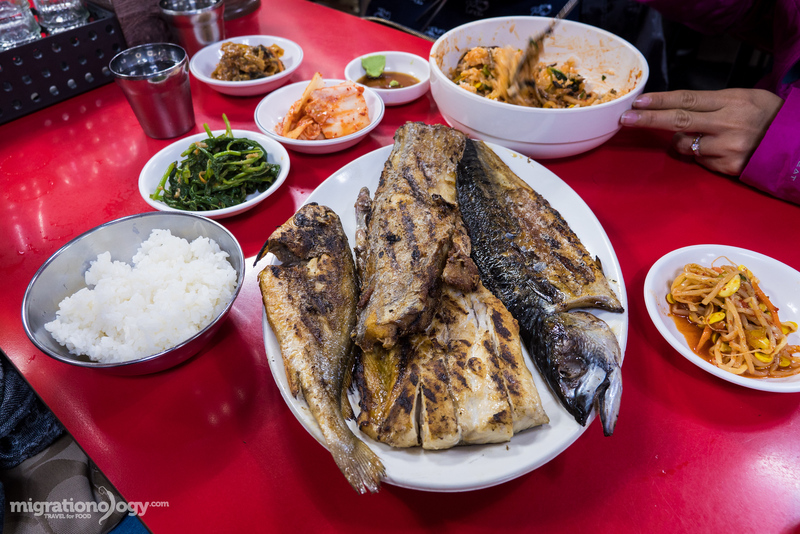 Just a five minute walk from Dongdaemun Station, in an area full of delicious food, is an alley which is known as the Dongdaemun grilled fish street. And if you’re looking for fantastic Korean grilled fish in Seoul, this is a place you’re going to want to check out. I’ll share all about it with you in this blog post. 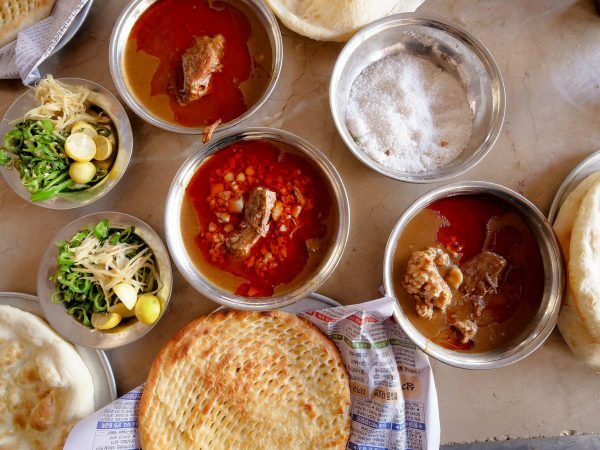 One of my favorite ways to discover food when I travel is to just walk around and explore. I’m not always sure where I’m going or what I’m doing, but for the most part, things tend to work out this way when you’re on the hunt for good food. On this particular evening in Seoul, my wife and her sisters and I decided to take the Seoul Metro over to Dongdaemun Station as they wanted to do some shopping. But we were all pretty hungry, so we decided to find something to eat before shopping. From Dongdaemun Station, we took Exit 9, walked for about five minutes, and came to a street to the left hand side called Jong-ro 40-gil. 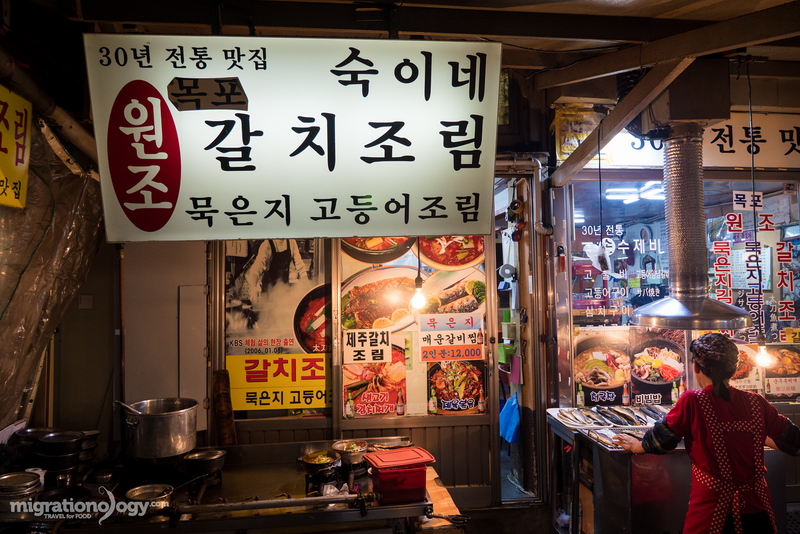 Along this road, you’ll see about a dozen or more Korean street food stalls, all serving a variety of the most well known Korean street foods like tteokbokki, gimbap, and twigim. We decided to have a pre-dinner snack. We ordered a range of different things including tteokbokki, the famous Korean rice rolls in red pepper paste sauce, gimbap, rice rolls, and some fish tofu sticks, similar to oden. 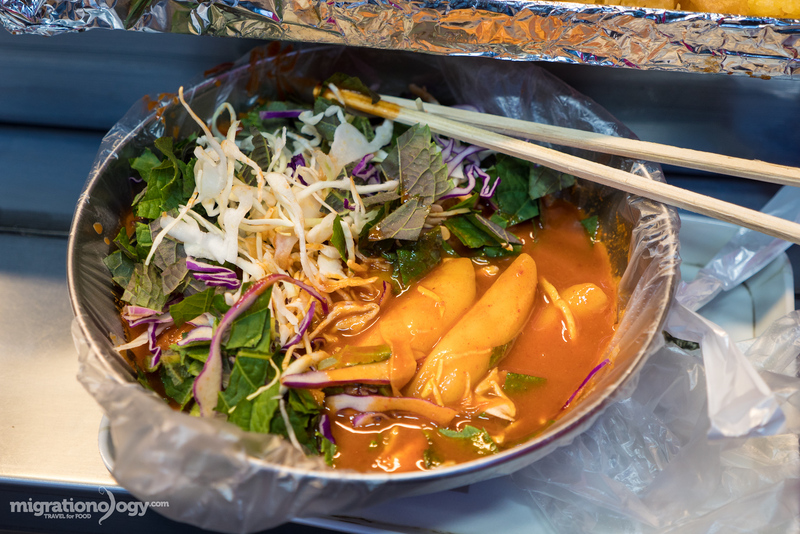 The tteokbokki, was particularly interesting because unlike many other places where they just serve the plain rice cakes with sauce, at this stand, they topped it with shredded cabbage and perilla leaves, giving it some extra crispness and freshness. Pre-dinner snacks complete, we continued down the street, and there’s a smaller walking only alley to the right hand side. 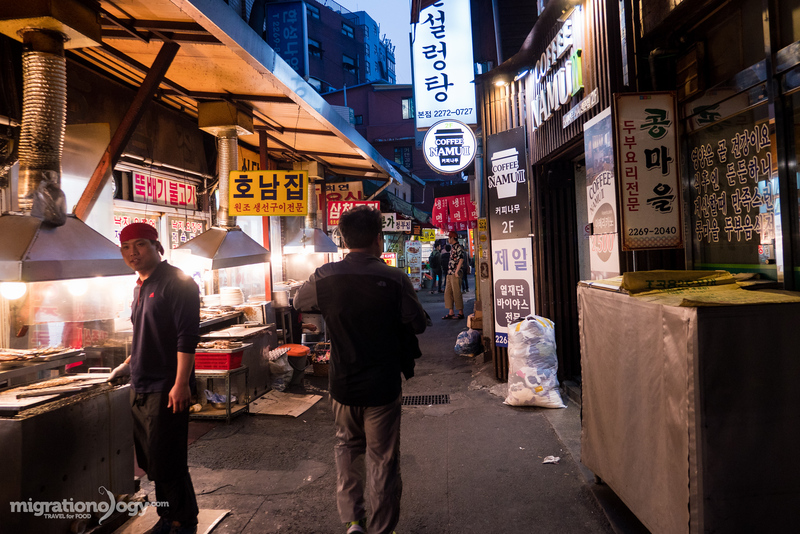 If you walk down this walking alley you’ll start to notice lots and lots of grilled fish restaurants and there are also a few very popular chicken restaurants as well, and you’ll be within the Dongdaemun grilled fish street. I didn’t know at the time, but after researching after we ate here, this grilled fish street is within the Pyeonghwa Market, and according to Visit Seoul, there are about 14 grilled fish restaurants that serve grilled fish along this alley. To be honest, just about all the grilled fish restaurants looked the same, and just about all of them were just as busy as the rest. So it finally came down to just choosing one of the grilled fish restaurants. We chose the restaurant in the picture above, for no particular reason, other than perhaps the Aunty was nice and called us to come and eat there (but most of the other restaurants did the same). The menu was all in Korean, but basically you can choose the fish of your choice, and it will come with a full set of banchan (side dishes like kimchi) and rice. For banchan side dishes, I received a number of different styles of kimchi, plus a green vegetables marinated in sesame oil, and a bowl of rice on the side. 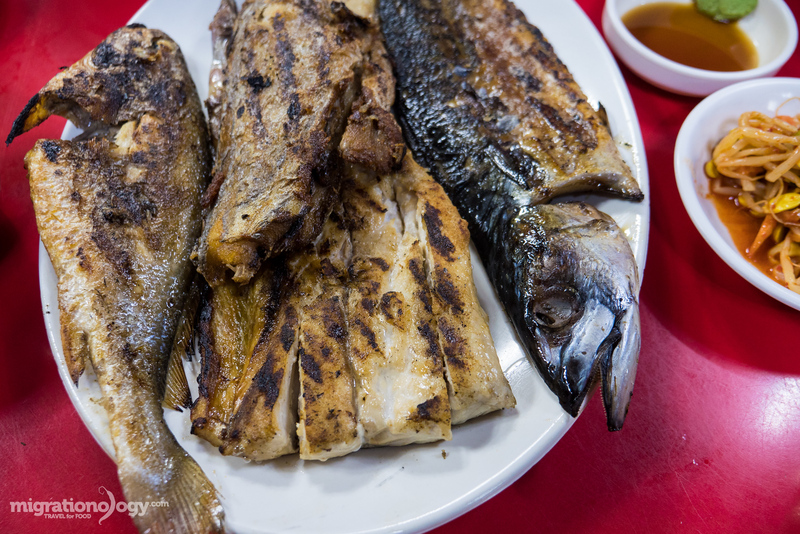 The main choice you have is what type of grilled fish you want to eat. Since I don’t speak Korean, I just went outside and pointed out the different types of fish I wanted, and we got a plate of mixed different types of fish. I ordered a Spanish mackerel, saba mackerel, and another small fish which I think was a type of threadfin bream. The fish at all the restaurants are brined in salt water, and they were pre-grilled, but as soon as you place your order, the fish will be thrown back on the grill for the final cooking. That way it only takes 5 minutes for you to get your order, and the fish are served to you hot and fresh. 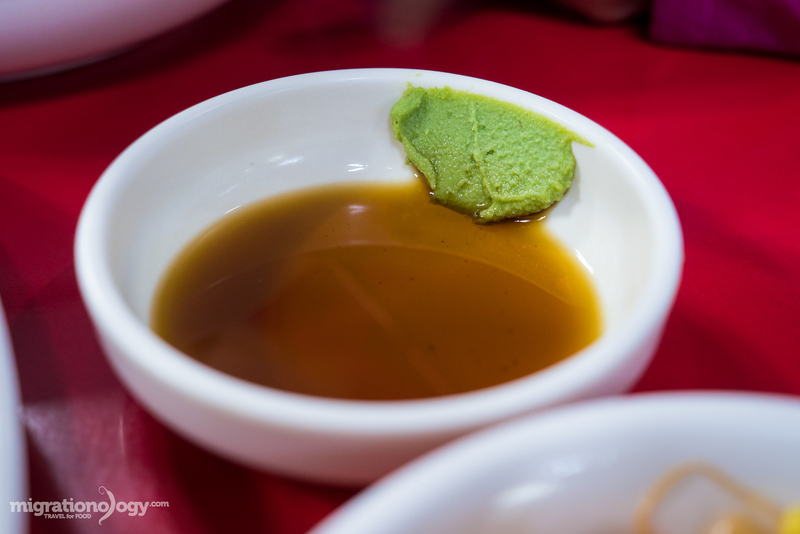 Although the fish was so flavorful and salty on its own with no sauce, they were served with a dipping sauce that included wasabi and kind of a light soy sauce I think. The wasabi was actually very mild, but it had a nice sweetness to it. The sauce went quite well with the fish and rice. Just look at those fish oils! Even just from looking at the fish from the outside I could see the omega 3’s glistening! Each one of the fish had the same salty flavor, but each had a completely different texture, and some were more fishy in taste. 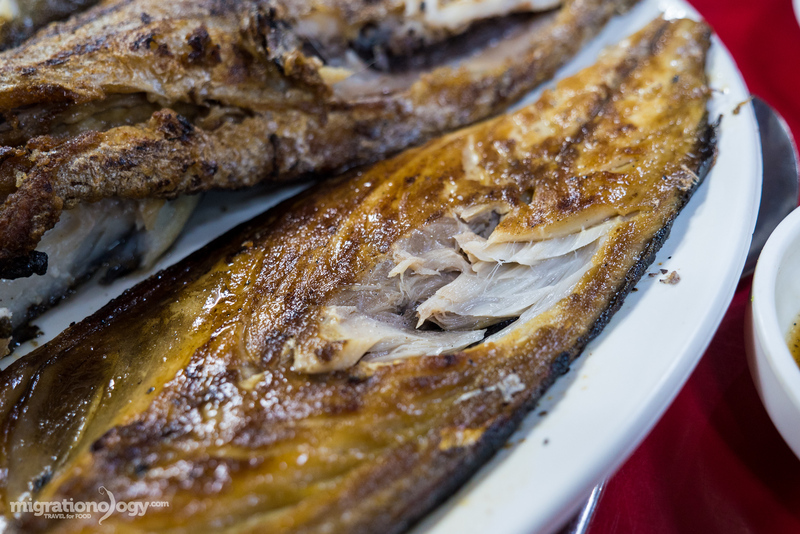 Probably my favorite fish of the meal was the saba mackerel. The buttery texture and all the oils made it so incredibly good. However, they were all good, I enjoyed the mixture of different fish. But do to the brining process of how this type of fish is prepared, they were all very salty. So they did go very well with lots of rice. 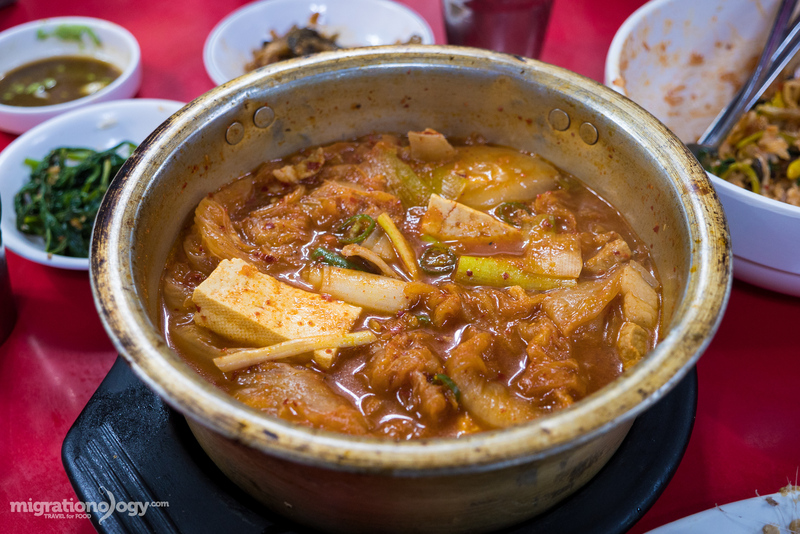 For an extra dish, we also ordered a bowl of kimchi jjigae, Korean kimchi stew. They cooked it in a pot over the grill as well, and it turned out to be a great addition to our Dongdaemun grilled fish meal. The kimchi jjigae was quite porky, lots of pork fat to flavor it, and the kimchi was nice and sour with big chunks of tofu and leek. Seoul is an extremely exciting city to eat in, and some of the greatest local restaurants are located down side walking streets and alleys. 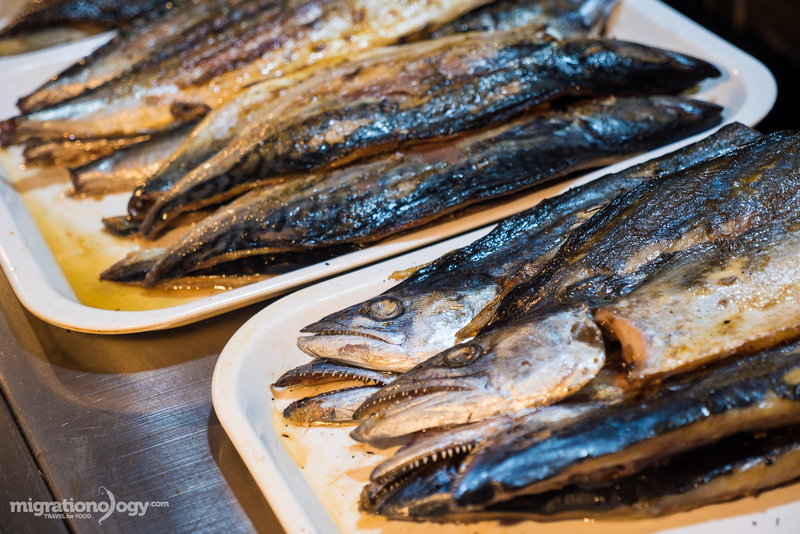 Near to Dongdaemun Market, within an alley just off Pyeonghwa Market, is what’s known as the Dongdaemun Grilled Fish Street. 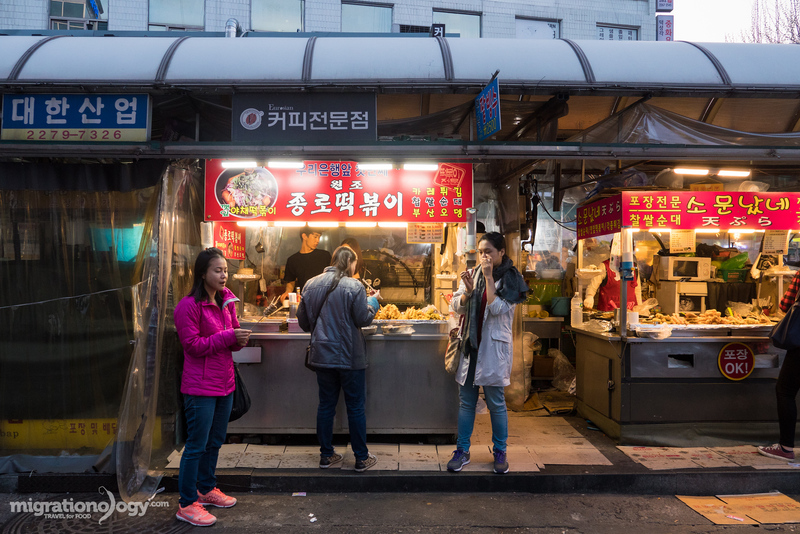 Along with Gwangjang Market, if you’re a food lover, having Korean grilled fish at a restaurant along this walking street is a great Seoul culinary experience. Open hours: I think for lunch and dinner. But I went in the evening and all the restaurants were open and busy. 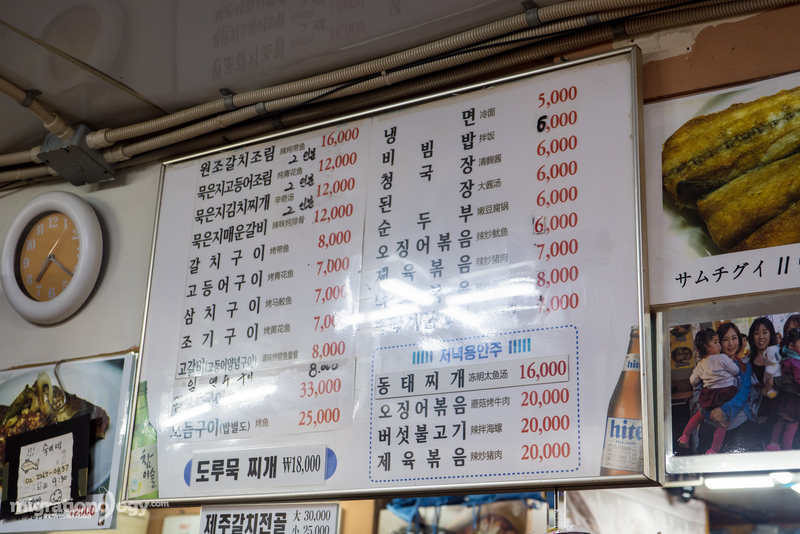 Prices: For one grilled fish, the price was about 7,000 Won, and it came with all the banchan side dishes. Also, it’s important to note that you’re expected to order one grilled fish set per person. 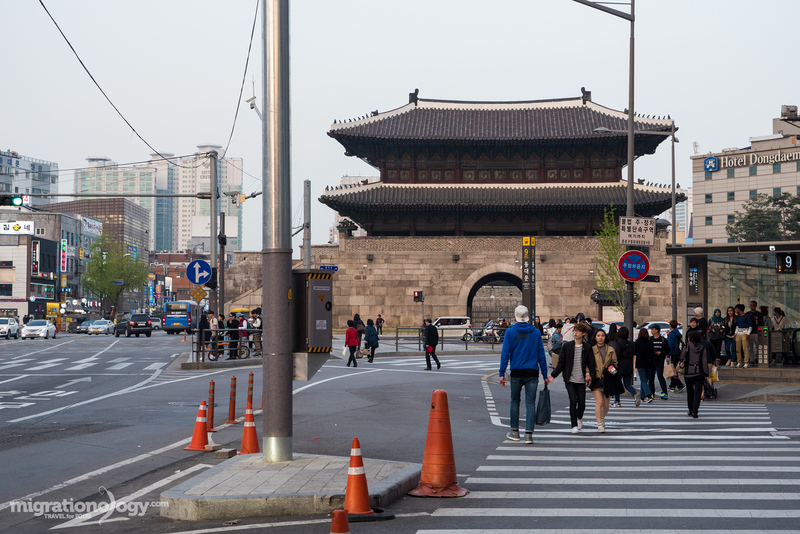 How to get there: Take the Seoul Metro to Dongdaemun Station, Exit 9, walk to Jong-ro 40-gil, make a left and walk past the street food stalls, then make a right onto the walking alley. Choose anyone of the grilled fish restaurants that looks good. You can check out my Seoul map here. Do you like grilled fish? That was the part of Seoul I missed, grilled fish street. It is quite challenging for Muslim traveler looking for halal food and the safest to eat would be vegetarian cup noodles. Glad to read this post, now I know where to go to get nourishment on my next visit. Not a big seafood fan, but I could see how someone into it would be in heaven here. Great pictures as always, and also want to say that I love your vlog as well! Hi Mark …2 years ago my sister had the opportunity to work in Korea for 2 month. She loves the food so much…same like you in your videos lol . Hello Mark! As usual great stuff. 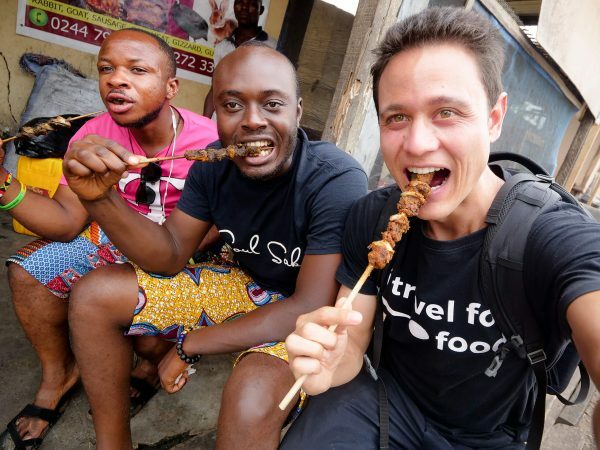 As someone said “Always great to connect with another travel and food lover”. The pictures are really amazing. Always great to connect with another travel and food lover. Wonder why I’ve never found you before! Anyway, hi, I subscribed. 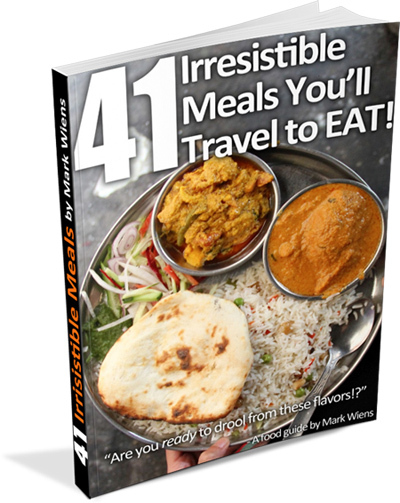 I’m a travelling exec chef learning ( slowly) to be a blogger. Your images are superb and the food looks incredible. -Muito bem Mark, boas fotos e texto, continue viajando e não pare nunca de nos informar! -Não esqueça do Brasil, seja bem vindo. These Red Table pictures are so enticing while the post is mouth-watering. Pre-dinner snacks are really awesome but I should go to Dongdaemun Grilled Fish Street. Mark,I follow nearly all of your clips in Thailand and in those countries you visited and I love your life style of traveling and I admire them all. If you permit,please tell me.How can you survive of doing this ? I really don’t want to be impolite by asking this question. Syed here. I am still waiting for videos from your trip to Bhutan. You went there last year, didn’t you? I know editing and uploading while travelling is not the easiest thing to do! 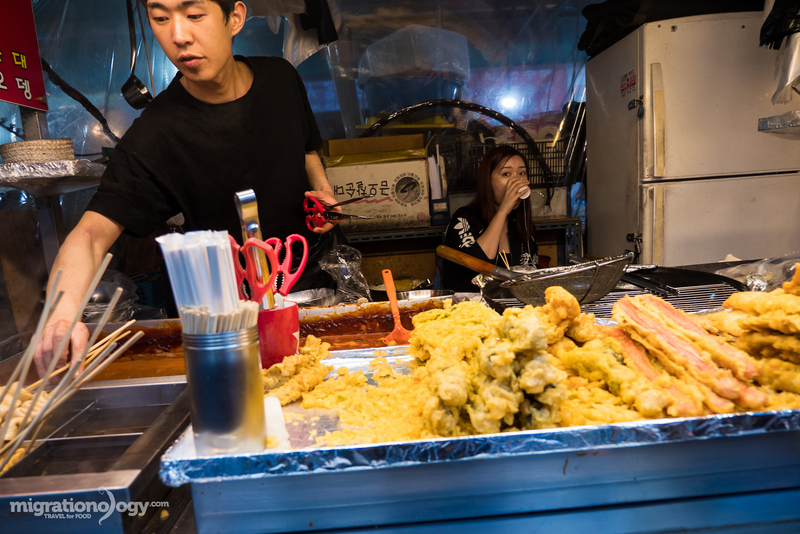 I had no idea Seoul could hide this kind of street restaurant… It seems delicious and I want to thank you for showing us this aspect of the city ! Your photos are BEAUTIIFUL and reading your blog is a real pleasure!! i dont like seafood but in Korea and Japan i totally changed my mind! Having lived in Korea, this post brought back great memories. It really does look delicious. Keep up the great posts and totally try GalbiJjim in Korea if you can. That was totally my favourite dish and oh so flavourful. Do you just try good food or do you sometimes go for the experience and try things that are not so good but very unique to a country? Love reading your blogs and watching your videos! I have always wanted to go to South Korea and try their foods! Your blogs are very intensive and detailed! 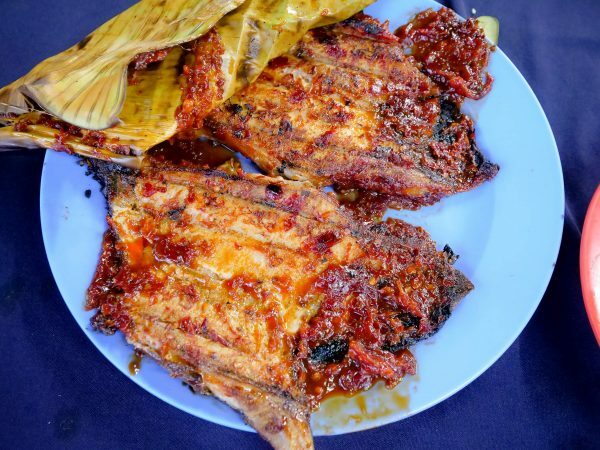 I am not a big fan of those grilled fishes but you made it sound and look delicious! 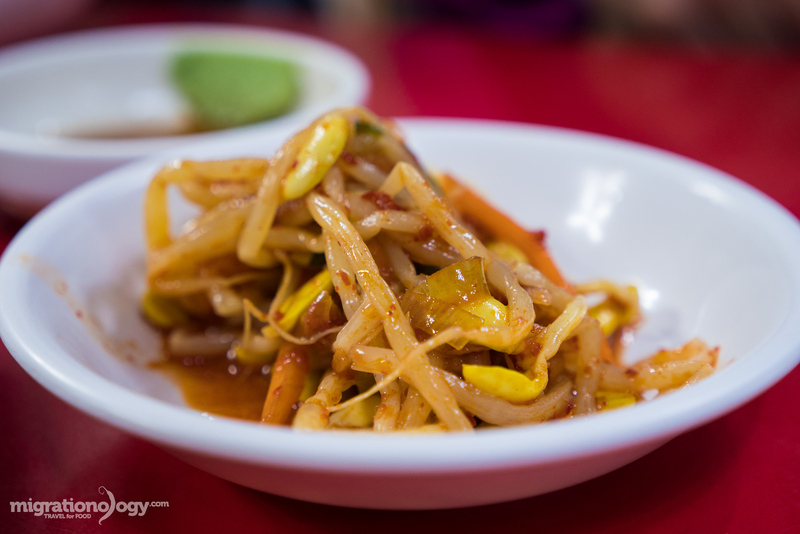 I would kill to try TRUE Kimchi in a variety of ways! I can’t wait to hear more from your South Korea adventures! How long are you planning on staying there? !